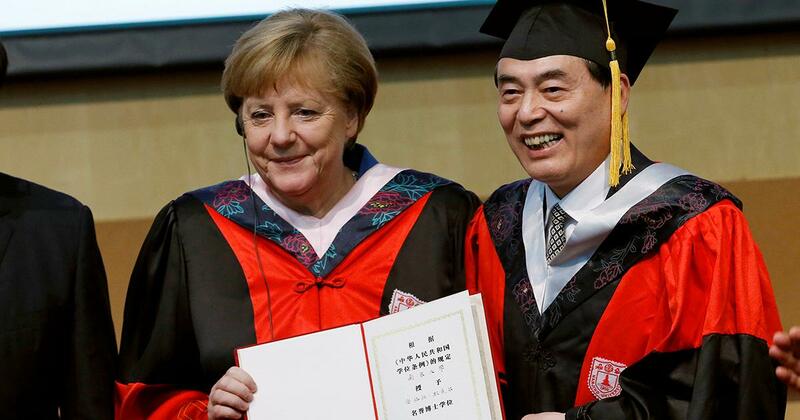 First and foremost, I would like to thank you for the honorary doctorate from Nanjing University. Above all, I would like to give my warm regards to the professors and students in Nanjing. 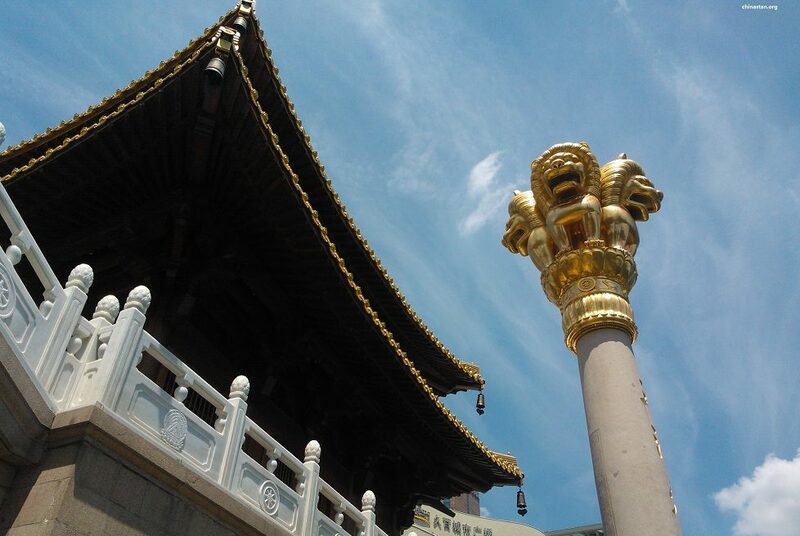 I only travelled as far as Beijing today, and not to Nanjing, but I remember my visit to the University very well indeed. It was very lively and we had intense discussions on topics such as women in politics and science. I wish you all the very best for the future. An honorary doctorate stands for two things: the existence of close ties and the wish to strengthen these ties. I am very pleased to accept the honorary doctorate from Nanjing University that you are awarding me today on behalf of the People’s Republic of China here at the University of Chinese Academy of Sciences. I regard this both as a sign of close personal ties and of the good relations between our two countries. It is a sign of optimism, also as regards these relations becoming even closer in the future. When I see so many young students before me, I am reminded of the time when I myself attended seminars and lectures. From my own experience, I know that the path to new approaches and knowledge begins when one first questions what one has known so far and thinks about what else one can still learn. It is only possible to ask oneself such questions in an atmosphere of freedom, creativity and discussion. To my mind, these are key characteristics of academic institutes. In other words, if one wants progress, one must allow and maintain openness and freedom in research and teaching, as well as in the academies and universities. Cooperation can expand such openness and freedom. This is why it is very important that we remain open to sharing knowledge internationally and with one another, but also to learning from one another. One of the most famous German natural scientists, Alexander von Humboldt, once said: “The most dangerous world view is the world view of those who have never viewed the world.” With this in mind, the German Alexander von Humboldt Foundation now supports exchange between distinguished researchers from all over the world. I was very pleased to hear just now that there are close relations with Max Planck institutes, the Fraunhofer-Gesellschaft, the Helmholtz Association and other scientific institutes in Germany. This is a good thing. It is an integral part of the strategic partnership between Germany and China, which we are now expanding via a wide ranging plan of action that includes over 100 projects. The current German-Chinese intergovernmental consultations play a role in this. By the way, one advantage of intergovernmental consultations, if they take place regularly, is that one has to continue and complete projects and present progress reports. This has greatly intensified our cooperation. I think it is never too early for any of us to start fostering open-mindedness and transnational learning. This is why we made 2016 the German-Chinese Year of School and Youth Exchange. We are supporting schools that offer courses to teach the partner country’s language and providing funding for exchange visits, stays with host families and many other things that allow us to learn from one another. We have non state organisations to thank for much of what is on offer. These include research institutes, chambers of commerce, foundations and non governmental organisations. All of them help to foster understanding and comprehension. Mutual understanding leads step by step to trust. For such work to have an impact, one naturally needs a legal framework that offers enough flexibility. This is why I will work to ensure that civil society organisations are able to continue enriching our bilateral relations – relations that necessitate exchange on all levels and in all possible fields – under China’s new law on non governmental organisations. Every time I visit China, I am amazed by the country’s rapid development – by the growing network of transport and education infrastructure and the dynamism of the megalopolises. All of this also means that living conditions are improving each year for many people. I think it is safe to say that China’s path is unique. It was certainly an extraordinary achievement to open the country to market forces, to learn from others and to reinvent oneself, thus giving some 500 million people opportunities to move out of extreme poverty. This fostered China’s rise. And this dynamism is also the basis of our cooperation. Great challenges, which China also faces, demand reliable partnerships. Germany wants to be a reliable partner for China. This is why we have held intergovernmental consultations at regular intervals since 2011. We will meet for the fourth time tomorrow. The prerequisite for a reliable partnership is that one shares fundamental principles and beliefs. This includes the rule of law, which is a crucial component of the constitution in Germany. During my trip to China in 2007, I visited the Sino-German Institute for Legal Studies. I was very impressed by the fact that Nanjing University and the University of Göttingen had set up this institute as early as 1989. It does not only foster dialogue between the Chinese and German legal cultures, but also educates students from our two countries. Given the wide recognition the institute enjoys and the continuity of its work, this cooperation is very special. That is why it is also part of our bilateral rule of law dialogue. This dialogue is complemented by our rule of law programme, which we use to train Chinese judges, lawyers and notaries. Germany has plenty of experience, for example in setting up a modern administrative jurisdiction and running a petition system. We are happy to share this knowledge with our partners in the Chinese Government. The rule of law dialogue provides us with a forum to discuss our understanding of the law, share experiences and launch concrete projects. The annual human rights dialogue is particularly important to us in Germany. It enables us to present our views on human rights issues. We do not always see eye to eye. We can try to find solutions or to work together on improvements. At the heart of the rule of law is the idea that the strength of the law applies – not the law of the strong. This means that the judiciary makes decisions purely on the basis of applicable law, that is, independently of the political system. It also means that everyone is equal in the eyes of the law. It includes transparent processes and decisions. Our understanding is of a rule of law – not merely a rule by law. This type of rule of law strengthens people’s trust in state institutions and their decisions, and thus also fosters social stability in a country. In this context, it is also very important – and this has been Germany’s experience – that legal proceedings must not only be thorough, but also completed within a certain period of time. If one has to wait too long – and one often has to wait a very long time in Germany – then it does not help if one receives justice, but the matter is no longer relevant. Apart from that, it is very important for any company that needs to calculate and plan – be this at home or abroad – to be able to count on a reliable legal framework. German companies – the members of the business delegation are also here with us today – have invested some 60 billion euros in China to date. This shows how important it is to also have a clear legal basis. Conversely, Chinese investors’ interest in Germany has continued to grow. There are already some very lively discussions on this topic. However, I want to underline once again that this is the reciprocity we have. Chinese companies will naturally also enter the German market. In view of our closer economic relations, legal certainty issues have of course also become more important. By the way, Chinese companies in Germany also ask us many questions about the German legal system, which is perhaps not always so easy to understand and with which one first needs to familiarise oneself. In our opinion, a legal framework’s merit is judged in part by the extent to which it treats foreign and domestic companies equally – for example in the case of public tenders – and ensures effective protection of trademark rights, patents and data. Reliable and transparent regulations are of the utmost importance to innovative companies in particular, for example in sectors that we in Germany define as Industry 4.0. Collaboration in the high tech sector is largely a question of trust. To this end, we need clear regulations and very effective legal protection. The latter can be created by rule of law structures with independent courts. China and Germany are working on implementing their mutual agreements to refrain from industrial espionage in cyberspace. In my opinion, the more progress we make in this area, the more we can get close joint projects in the field of Industry 4.0 off the ground. The close connection between the rule of law, adherence to established regulations and fruitful cooperation in a spirit of mutual trust can in fact be seen on all levels – both nationally and internationally. Showing commitment to the norms of international law by adhering to the rules is thus the cornerstone of the international system. Trust can only develop between larger and smaller countries and between richer and poorer countries when sovereign countries make and uphold voluntary commitments. China has helped to shape modern international law. The country plays an active role in the United Nations and is a permanent member of the UN Security Council. It is a member of the International Monetary Fund and the World Bank. It has also been a member of the World Trade Organization since 2001. China is a signatory to many multilateral agreements. I think one can say that on the one hand, China itself has benefited from the stability of the established international legal framework. On the other hand, the country has expanded its role in international bodies step by step and in line with its economic rise. We expressly welcome this. The People’s Republic of China currently holds the Presidency of the G20, the group of the 20 leading industrialised and newly industrialising countries. We will all meet in Hangzhou this autumn for the summit of the Heads of State and Government. China has set itself an ambitious agenda. We are very interested in working with China in this process. Germany will host next year’s G20 summit. This is why we want to carry parts of the agenda forward, thus creating close cooperation. China’s increased economic weight must be taken into account internationally. There was a lengthy discussion on changing the voting shares in the International Monetary Fund. Germany was in favour of China being granted greater voting shares in the IMF and World Bank, as this reflects its greater economic strength. We supported the inclusion of the renminbi in the basket of currencies in the IMF’s special drawing rights. This will start on 1 October. And we are also the largest shareholder from outside the region in the Asian Infrastructure Investment Bank, which was founded on China’s initiative. In our view, the fact that China is playing a constructive role internationally is simply the logical outcome of its greater economic strength. With economic strength comes greater responsibility. After all, a look at the map of the world shows how many conflicts we have to overcome worldwide. China is needed as a pillar of the established international order. This was shown for example in the E3+3 nuclear talks with Iran, which we were able to bring to a successful conclusion after many years. It is also shown in the six party talks with North Korea that have not yet proved so successful. But why should we not also work even more closely together on the other challenges we need to overcome together? Afghanistan is one example. I am pleased that we will also work together on a very practical level in joint projects to help rebuild this ravaged country. In the pilot phase, we plan to provide funding to Afghan disaster relief organisations and to work together in the field of mining training. China is also very active in Africa – and not only in business, but increasingly also in humanitarian and peacekeeping measures. Mali is an obvious example of where Germany and China could work together. We would welcome such cooperation, as we ourselves are providing support in Mali. China has recently taken on great responsibility internationally as regards protecting the climate. The Paris climate agreement would not have come about had the United States and China not worked very intensively together and had China not been one of the authors of this agreement. The deal reached at the climate conference in December last year and the agreement by the United Nations on sustainable development goals are two major multilateral achievements, which we now need to implement intensively. These examples of China’s commitment have generated trust, which now should be reinforced – including in the case of tensions we are currently seeing, for example in the East and South China Seas. I am pleased that we can also say as part of our dialogue that China and Germany are committed to upholding the maritime order on the basis of international law, including the UN Convention on the Law of the Sea and the freedom of navigation and overflight firmly laid down in it. It is in the interests of all countries to uphold this order and to maintain stability in the region. Both China and Germany support peaceful solutions to territorial disputes and issues involving maritime rights – peaceful solutions in line with international law, regional arrangements and bilateral agreements. Let me say frankly that Germany would be pleased if, for example, a binding code of conduct were to be agreed with the ASEAN countries and China. Ladies and gentlemen, as you see, we have plenty to do. Much work lies ahead of us. Much trust has grown. Much intensity is found in our cooperation. We regard our partnership as a win win situation for Germany and China. This should also enable us to aim for pragmatic solutions in areas where there are still differences of opinion. I am very grateful indeed to be welcomed here today ahead of the German-Chinese intergovernmental consultations. I would like to thank the initiators from Nanjing once again for awarding me this honorary doctorate. I now look forward to lively discussions with the students and audience.